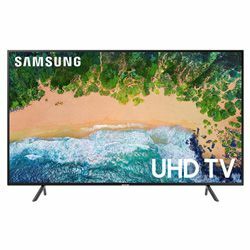 I made Samsung 50NU7100 vs LG 49UJ6300 review to compare two Smart TVs functioning on different types of matrices: VA in Samsung versus IPS in LG. Also, an important factor in comparing TVs is that they work on the basis of completely different operating systems. Samsung 50NU7100 is equipped with a high-quality 50-inch display, which is little more than LG has, with a resolution of 3840 x 2160 pixels and side LED-backlit. The Samsung 49NU7100 produces good picture quality. It has an average contrast ratio, it is lower than normal for VA panel. The panel isn't very bright, especially in HDR, and viewing will be better in a dim room. It has fine gray color reproduction. The TV is better suited for viewing SDR content, due to a limited color gamut and poor color volume. The LG 43UJ6300 has an average image quality at a 4K resolution. LG has a low contrast ratio and poor black uniformity. In a poorly lit room, black tones tend to look gray. The model has HDR support but cannot reproduce rich colors. The dynamics of the image is excellent since the model has a short pixel response time on the screen. The 50NU7100 runs on its own Tizen platform. This gives the TV access to applications such as Amazon, Netflix, and YouTube. Also, Samsung 50NU7100 supports Bixby and SmartThings technologies. The operating system for LG 49UJ6300 is WebOS 3.5. There are several popular applications for Netflix, YouTube, and Amazon Video. All applications run smoothly, without delay. 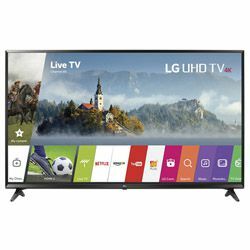 The LG 49UJ6300 vs Samsung 50NU7100 review is based on a comparison of the functionality of TVs and LG has several more useful features, such as picture in picture and digital recording. Samsung 50NU7100 looks thin. Build quality is well. The screen occupies 90% of the front panel. The body feels solid even though it is entirely made from plastic. A stand is stable and sturdy with a wide range of plastic legs. The body of LG 49UJ6300 is made of plastic. The design is minimalistic, without stylistic elements. A stand gives the TV a satisfactory stability, although it is made of plastic. A screen occupies 92% of the front panel. The TV has UHD Dimming technology to enhance contrast and provide deeper black in dark scenes. The matrix is well calibrated by the manufacturer. The image loses quality when viewed from the side. LG 49UJ6300 has low blur dynamic scenes. Wide area of VESA interface (300x300). Inaccurate RGBW pixel structure applied.